Generations of future property lawyers and educators were inspired by Professor Emeritus William (Bill) G. Coskran’59. Coskran’s ties to Loyola go back to his undergraduate degree, which he earned at Loyola Marymount University. He graduated first in his Loyola Law School, Los Angeles class in 1959. After spending two years in the U.S. Air Force JAG Corps, Coskran entered private practice focusing on real property and construction law. He quickly returned to the Law School, though, first as an adjunct professor, and then as a full-time teacher in 1968. Dean Michael Waterstone called Coskran "a treasure to our community and represented the best of who we are." Known for being a humorous, unpretentious and friendly—and just a tad tough in the classroom— Coskran continues to influence generations of Loyola graduates. In 2014, he was named to the Loyola Law School's list of "50 Inspiration Alumni" on the occassion of the 50th anniversary of the Albany Street campus. "As part of a faculty known for great teaching, Bill Coskran is perhaps the finest teacher of them all," Professor Victor J. Gold said of Coskran. "What makes Bill nothing less than a classroom legend is his unmatched ability to help his students understand and apply the most difficult aspects of law to a concrete set of facts. No one has ever been better at performing the magic of turning students into lawyers." 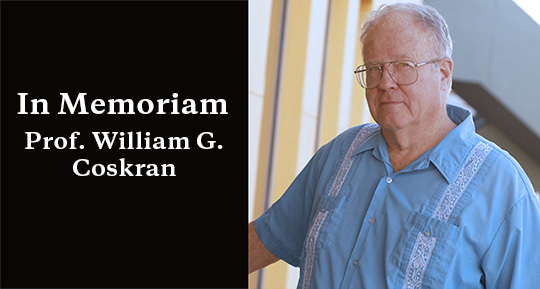 The Law School established the William G. Coskran Chair to recognize Bill for all his contributions as a loyal alumnus, an exceptional professor and an extraordinary human being. Professor Coskran taught Future Interests, which is a class unique to the field of law. Studying Future Interests with "Wild Bill" Coskran was like studying piano under Chopin. It deals with the "rule against perpetuities", widely considered to be the most difficult principle in jurisprudence. I doubt if a thousand people in the US understood it as well as Prof. Coskran. It was the only subject in law school that reminded me of calculus. After we got our grades a student complained to him that he only got 80 per cent in the course. Prof. Coskran didn't budge an inch. "I've seen students get down on their knees and BEG me to give them eighty per cent!" he said. Once he brought in the TV Guide and told us that a local station was showing a series of steamy films for 'Chick Week', beginning with Kathleen Turner in "Body Heat". "I guess they'll all be about the rule against perpetuities," he said.